Frozen Plasma's debut single, "Hypocrite," was released November 24,2005; their first album, "Artificial", was released April 25, 2006 through Infacted Recordings in Europe and through Nilaihah Records in the U.S.
Felix started to create music in 1994. The initial pieces consisted exclusively of synthesizer -, drumcomputer and sampled sounds, which were steered via a software sequencer. Since 1994, there have been different stylistic changes and developments from Hard Trance, to House and Rave and later to a symbiosis of Dream House and Trance. The developments in the creation of his music went hand in hand with a regular commitment as DJ. First limited to parties and school happenings, he soon became a resident DJ in local clubs, which gave him the opportunity to present his own material to a broad public. In 2001, Felix joined efforts with his long-time friend Torben Wendt in his Dark Wave group Diorama as producer, background singer and live keyboard player. This co-operation brought forward some amazing musical pieces and experiences. The latest release is called A Different Life which is already their 5th album. During a support tour with Diorama for VNV Nation in April 2005, Felix connected to Vasi Vallis who was playing live keyboards for VNV. In the aftermath, they decided to start a collaboration with Felix being the lead singer. Vasi's first project appeared in 1986. His minimal techno/acid project Galatea became a well known name in the Swiss underground scene. After several Acid productions for Galatea and some co-productions for popular Swiss, Italian and German underground DJ's, his style changed into the early minimal techno, when techno was underground and not commercial music. Vasi became an in-house producer for several techno labels and worked as a talent scout for Sony Music Switzerland. In 1994, he produced his first pop/eurodance project, Provocation, which had a top 10 hit in Switzerland and top 50 in the Spanish and Italian club/dance charts. 1997 he produced some album tracks as a "ghost producer" for several major labels. The more he worked with majors, the more he disliked the way they treated their bands and he missed the emotion and passion for music within this highly commerce-focused industry. The following years, he focused on the setup of a new studio, which gave him the possibility to work independently from labels or other producers. In 2001 he discovered bands like VNV Nation, Apoptygma Berzerk, Neuroticfish and Assemblage 23 which combined techno/trance elements with melancholic chords and vocals. He decided to start his own project and found a singer (Henrik Iversen) who's voice fitted perfectly to his new sound. The band was called Namnambulu and was founded in the summer of 2002. In March 2003 he signed a deal with Infacted Recordings, a new label founded by Torben Schmidt. Torben had the ideas, vision and passion for music Vasi was looking for. The first longplayer "Distances" became a huge success in the scene and NNB played about 40 gigs all over the world. Vasi produced more than 25 remixes for bands like Suicide Commando, [:SITD:], Lights Of Euphoria, Tom Wax or Absurd Minds. In April 2005, he joined VNV Nation as live keyboarder and played the Matter and Form tour as well as the Mera Luna Festival in Germany. In June 2005, Henrik left Namnambulu due to personal issues. Just 2 months later, Vasi released his industrial Project Reaper which was in the German Alternative Top Ten for 6 weeks and reached number 1 on the Dutch Alternative Charts. 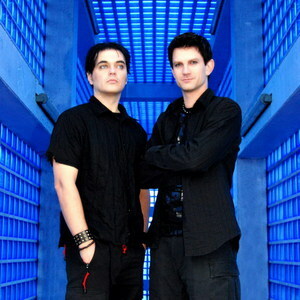 Vasi then met Felix on a VNV Nation tour, and the two musicians embarked on a journey that would become Frozen Plasma.